If you missed the action you can find complete event coverage at vans.com/poolparty. Also, visit offthewall.tv for tons of video highlights as well as heats on demand, which will be available for Masters and Pros finals. We did a mini “Get to Know” with Vernon Courtland Johnson, creator of some of the most popular and coveted graphics from Powell-Peralta and skateboarding in general. If you’re lost, then just look at the pictures. Classic doesn’t even describe them. Forged in our memories forever, we can now see these icons transcend the generations as we get ready for a new revolution of rippers. Stay tuned for updates from the Bones Brigade Chronicles. What makes deck graphics different from other artwork? What was your favorite graphic? What’s it like seeing your images assent to the ranks of cultural icons? Why do you think people connected with your art like they did? What’s the best thing about working with Powell-Peralta? Stronghold Society’s Walt Pourier & Wounded Knee Skateboards, Jim “Murf” Murphy (ALVA team skate legend) are gonna setup to inspire @LNI… Lakota Nations Invitational, December 15th-17th…. gonna rock with hundreds of Native Youth with the South Dakota Gear UP program, Stacy Phelps and crew you rock!! Thanks for allowing us to inspire and instill hope through the Live Life Call To Actions Campaigns we are creating! Introductions to the plan of action @ LNI… It’s all about this generations youth movements! Its ON! A CALLING – The stronghold is a place where a community regroups, a place to stand your ground and together face all of lifes challenges… to ride out the coming storm. Lakotas have a word, “SKAN” interpreted as “something that moves”. Spiritual vitality, the force of life itself, something each of us and all of life possess within. It is believed the black birds fly to warn of the approaching storm, of hard times to come… but it is not to create fear, its is to build compassion, togetherness and hope amongst the people, for once the storm passes, we get renewal… a clearer view from within, this is our Stronghold Society call to action. C. To create and sustain an art resource studio and skateboarding park on the Pine Ridge Indian Reservation, SD to provide Native youth an outlet for their creativity through resources collected and/or developed by Stronghold Society. Alot of plans on the move for 2011 and beyond… Multiple Poster Campaigns, Wounded Knee 4-Directions Skatepark planning and Skate Events to support, support of the Kimimila Gathering “Age of the Daughters”, Projects with the Nakota Dogs Movement, new support product from SKAN life. movement… etc. Big year ahead…. appreciate all your support, because of you… we can do the things we do, for others. Starring: Jello Biafra, Chryssie Hynde, Jim Jarmusch, David Johansen, Mick Jones, Wayne Kramer, Glen Matlock,Legs McNeil, Thurston Moore, Tommy Ramone, Henry Rollins, Captain Sensible, Paul Simonon, Siouxsie Sioux. Los Angeles, CA – In the mid-1970s, a revolution was ignited on the streets of New York and London. Almost overnight, punk shattered the status quo and continued to impact all future generations of youth culture. On January 11, 2010, Shout! Factory will release the long out-of-print documentary PUNK: Attitude. Directed by Don Letts, the film and its extensive bonus features, chronicle the origin of punk music and its socio-cultural and musical impact through interviews with key figures such as Henry Rollins, Thurston Moore, Jello Biafra, Chrissie Hynde and more. A must-have for fans of punk music, documentary aficionados and DVD collectors, the two-disc set of PUNK: Attitude is priced for everyone to own at $19.93. With a cast of historic and modern figures in popular culture, the documentary ventures beyond the hype and explores the way punk music redefined popular music and fashion while legitimizing an independent, do-it-yourself attitude that inspired an entire generation of musicians, filmmakers, poets, photographers, fashion designers and graphic artists. PUNK: Attitude was officially released April 25, 2005 at the Tribeca Film Festival and later aired to critical acclaim on IFC. The DVD-set has long been out of print. • U.K. Vs. The U.S.
Stacy, Rodney, CAB, Tony, MIke, Lance and Tommy will be working on a Bones Brigade Documentary starting in February 2011. On Monday, November 29th at Los Angeles International Airport, seven individuals that have had an extreme influence on skateboarding sat down to discuss work on a documentary of their experience. They met at the Encounter restaurant in the middle of the airport to begin work on this monumental film. Stacy wrote, “Those skaters known as the Bones Brigade are now old enough to take a look back. At a time in the 80’s when many people were mourning the second death of skateboarding, the Bones Brigade through passion, drive, creativity and a surprising sense of teamwork redefined the sport for their time and the future”. Simultaneously, a Powell-Peralta coffee table book is in the works. It will include the Bones Brigade, but also other things you knew and didn’t know about Powell-Peralta. Bob Marley is a musical prophet, whose words and vision forever changed the world. His image evokes a rich legacy and emotional connection that transcend generation, ethnicity, gender and geopgraphy. His voice touches, inpsires and moves. He is a phenomenon merging myth, man, musical genius, social awareness, and cultural relevance into a way of life embraced universally. “I love it! The collection is cool and conscious,” said Ziggy Marley, when asked about his feeling on the environmental sensitivity Billabong has taken care to use in The Billabong x Bob Marley Collection. The Billabong x Bob Marley Collection will be available by mid December in selected specialty stores and Billabong Stores accross Europe. It’s that time of year again… can you believe it? This holidays, they’re letting YOU decide what’s on sale… purchase one of our bundles and simply tell them which CDs or LPs you want in our PayPal shopping cart. No concrete, No Cash. Maybe not that extreme but the The Tony Hawk Foundation announced August 5th that skateparks applying for grants with a budget of $50,000 or more must be built out of concrete in order to help create a longer lasting influence of skateboarding around the country. Advances in concrete pouring and skatepark building has decreased the cost of building concrete parks consistently over the last two years and in a considerable amount of instances become less expensive than using steel-framed modular pieces to build a park. If the latter is the desired route of the park hopeful skaters may still apply for grants, however if their budget is under $50,000 they must prove that they’ve had concrete estimates done and that it is out of their price range. While concrete may seem more costly in the short term it is the long term plans that show more cost effectiveness. Maintenance costs for modular parks over a couple years proves to be much more costly than maintaining a concrete park. One would hope that a park would be around forever and to have it close due to a lack of upkeep is a crime. COSTA MESA, Calif. (July 20, 2010) – TAVIK kicks off the summer by teaming up with the Downtown Disney District in Anaheim on its Action Sports Weekend, from Friday, July 23 to Sunday, July 25. For the first time in its history, Downtown Disney® will host the action sports community in a collaborative event featuring performances by top skate and BMX athletes. As a part of the event, TAVIK will showcase live skate demonstrations and live art performances. Alongside TAVIK, leading action sports companies including Quiksilver, DC Shoes, The Board Factory and Coppertone have planned activities to light up the big weekend. On Saturday, July 24 at 6 p.m. a special skateboarding exhibition will showcase Tony and friends in ‘Quiksilver Presents The Tony Hawk Skate Jam’. This event will showcase top skateboarders in a ‘jam’ format and BMX athletes will exhibit on a giant vert ramp located smack in the middle of the Downtown Disney District main plaza. In support of the event, several renowned athletes, such as Lincoln Ueda, Josh Stafford, Jesse Fritsch, Kevin Staab, Lyn-Z Adams-Hawkins and bmx rider Tom Stober, will accompany Quiksilver team rider Tony Hawk in this unique event. “The energy of Action Sports Weekend will be sensational and we are looking forward to showcasing our action sports retail partners,” says Jean Nicassio, Manager of Downtown Disney Initiatives. Starting Friday morning, guests may enter to win a Stand Up Paddle Board at the TAVIK Kiosk, as well as participate in a “Spin the Wheel” contest for a chance to win a variety of prizes such as tees, hats, posters, magazines, and more. TAVIK is an iconic Southern California lifestyle brand that exploded out of a fusion of surf and street. TAVIK differentiates itself with loud, ‘out there’ designs that scream to individuals and empower them to define themselves. Its distinct style coupled with clean, contemporary lines produces a brand that goes beyond trends and fosters originality. TAVIK is more than apparel- it is a radical lifestyle movement in itself. Led by people who pump up the volume every chance they get, TAVIK advocates a dynamic lifestyle colored by energy, music and motion. www.tavik.com . Meet TAVIK- fabricating visions since day one. About Downtown Disney®: A lush garden oasis during the day and an energizing entertainment district at night, Downtown Disney® is the high-energy place for Southern California locals. Guests can experience a great variety of shopping, dining and entertainment. Downtown Disney® is located next to the Disney theme parks at 1580 S Disneyland Dr. Anaheim, CA 92802-2294. 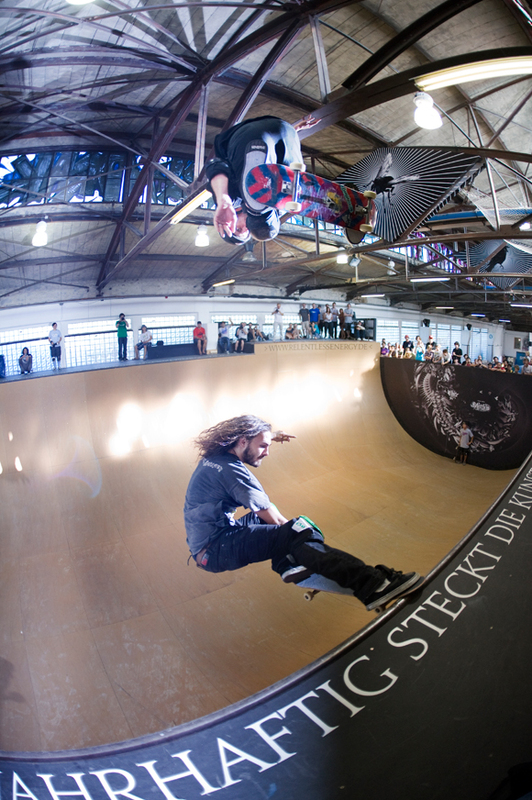 Tony Hawk throwing out a casual McTwist on the newly renovated vert ramp at Skatehalle. Hawk again throwing it down with a Treflip. Killer Doubles photo of Tony Hawk doing a frontside air over Alan Young as he hits a super stylish crail slide.